How would you like to land premium clients, retain them long-term, and explode your bottom line? "Karen Callahan brought billions in new revenue to American Express and she can do it for you too!" For many organizations, landing clients and creating effective marketing campaigns that consistently generate profitable response rates and keep customers satisfied…can be challenging. If you're interested in using the skills of a Veteran Copywriter, Rainmaker, and Marketing Strategist to build your business I'm your solution. I'm Karen Callahan and I’ve been working with global clients creating copy, developing sales and marketing strategies, and launching campaigns for over two decades. When you work with a veteran like me, you'll be working with someone who understands the sales and marketing process, and can get your project completed quickly allowing you to focus your attention on other priorities. I specialize in helping sophisticated private and public sector marketing departments and ad agencies in creating persuasive copy and producing effective marketing tools, both online and off. These materials help companies siphon market share from competitors, improve customer retention, and increase competitive differentiation. Why settle for just a copywriter--when you can get more? I've handled projects in a wide variety of industries including computer hardware, software, entertainment, electronics, publishing, financial services, real estate, retail, health care, telecommunications, hospitality, travel and tourism, government, trade associations, mail order, online services and non-profit organizations. I’m now working with businesses and agencies like yours . . . using my skills to deliver measureable results. Make no mistake. Your prospects may never understand the benefits of your offer. . . unless your message grabs their attention and motivates them to take action. When you need that kind of copy. . . the kind that makes you money . . and generates leads, you need an experienced, direct response copywriter like me. Someone who can provide you with the writing skills, sales ability, and product knowledge you need to produce effective communications materials. Book double-digit growth by improving the response rates of sales letters, direct mail packages, telemarketing scripts, email, and advertisements. Skyrocket their profitability by creating sales tools, ezines, press materials, case studies, and white papers that make prospects think of you first when they need what you are selling. Siphon market share from competitors by improving conversion rates of websites, landing pages, email messages, and microsites. "Billions in new revenue...and now it's your turn!" If you’re a serious marketer interested in generating measureable results and need the assistance of a professional, commercial copywriter with hands-on sales and marketing experience then I am the solution for you. A mass transit marketing campaign that blew away expectations generating a whopping 420% response rate. A Federal Government Agency contract continuing to book $1.2 billion annually. A website sales letter delivered 200 new customers to one client before his marketing campaign even launched. A real estate investor who was profiled on the front page of a major newspaper and interviewed many times after a reporter read the sales letter and biography I wrote about him and his product for one of his websites. He is now the "go to" guy for observations on the state of the Real Esate industry in his market. A home improvement retailer acquisition delivered $80mm annually for a client. I've transformed marketing campaigns, and landed literally thousands of new customers for my clients. . . and not just small fry either. I've worked with quite a few heavy hitters over the years. Some of my clients include the U.S. Department of the Treasury, Marriott Hotels, Shubert Theaters, AOL, USPS, Time Warner, The NBA, The Washington Post, Tiffany, LVMH, The New York Yankees, Gannett, Washington D.C. Convention and Visitors Bureau, QVC, T.J. Maxx, IKEA, the Greenbrier, and thousands of other companies. Specifically, I collaborate with general, direct response, and interactive agencies, businesses, associations, and government entities interested in creating persuasive copy, landing big accounts, applying fresh thinking to campaigns, and providing solutions to their clients that maximize results and reduce turnover. Due to corporate downsizings, there has been increased demand for my services. In order to provide clients the quality of service they deserve, I limit the number of jobs I accept so I can give each customer the individual, quality attention they deserve. So, if you are truly interested in working with a proven, results-driving professional contact me today! We can talk about your project and work together to develop a plan that achieves your objectives. Do you have experience in my field and what type of writing projects do you handle? If you sell B-2-B or B-2-C, chances are I already have copywriting experience with your type of product or service--or something very similar. Now that you have a little information about my background, click here to go to my portfolio page to see samples of the work I have created for some of my clients. I produce a wide variety of sales and marketing materials for my clients. Most of my freelance copywriting assignments are writing copy for direct marketers online and offline: sales letters, landing pages, squeeze pages, e-mail messages, magalogs, DM packages, case studies and white papers. However, I also provide copywriting for many other marketing communications including ads, feature articles, press releases, sales brochures, newsletters, catalogs, case histories, and web page content. I specialize in writing clear, credible, persuasive copy promoting a range of products and services, from the simple to the highly technical. I am currently providing clients with a variety of business development support services to get an overview of what I have done in the past visit my services page. Visit my Portfolio or Case Study pages for examples of the type of marketing campaigns I've launched, examples of the results I have delivered for others, or to get an idea of what I will make happen for you. 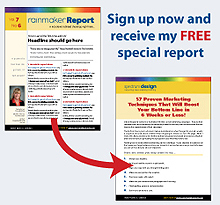 Finally, don't forget to request your copy of this valuable report, "57 Marketing Techniques Proven To Boost Your Bottom Line in 6 Weeks or Less" for tips on how to create powerful communications that boost your profits. Simply enter your name and email address in the boxes indicated at the top of the left hand column on this page to receive a copy of this report. When you're ready for assistance with cutting-edge sales copy, a break-through marketing campaign, or if you would like to develop client retention or sales strategies simply contact me now.